France’s goalkeeper, Stephane Ruffier, catches the ball during a training session the day before the Group E World Cup soccer match between France and Switzerland at Arena Fonte Nova stadium in Salvador, Brazil. Friday’s France-Switzerland tilt represents a battle for first place in Group E, as both teams are tied with three points after winning their first matches. But though the winner will be in the driver’s seat for advancement, the stakes aren’t especially high for the loser either. 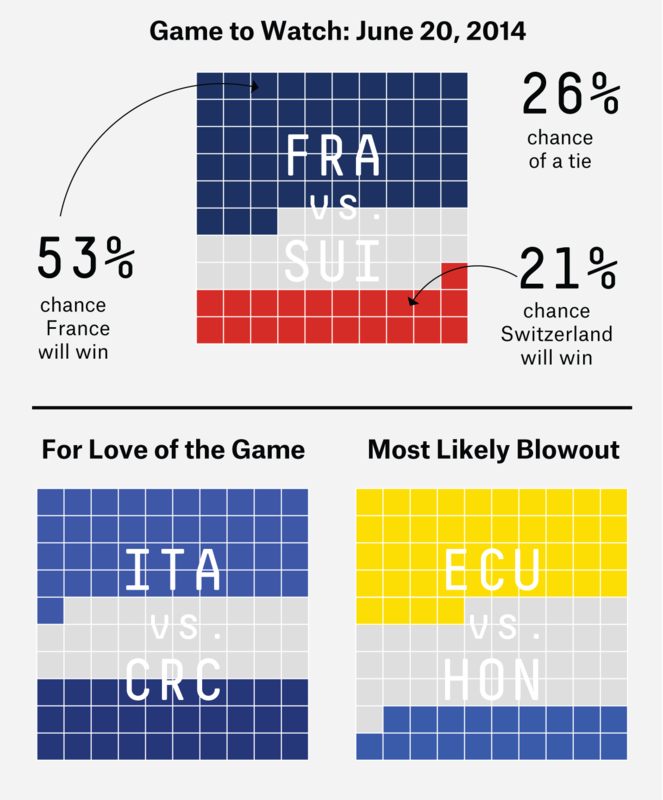 As things stand, France has a 91.8 percent chance of getting into the knockout stage of the tournament, and the Swiss check in at 80.9 percent. Ecuador and Honduras — who make up the rest of Group E and also face off Friday — lag far behind, at 20.3 and 7.1 percent, respectively. Honduras has a bleak outlook, mainly because they are the second-worst team in the World Cup field, according to ESPN’s Soccer Power Index (SPI). But Ecuador, according to SPI, is essentially Switzerland’s equal; the only difference in its advancement probabilities stems from Switzerland’s thrilling added-time victory over Ecuador on Sunday. For Ecuador, it was the one that got away; without that win, the model projects Ecuador to amass only 2.8 points within the group — they’re likely to beat Honduras but will be clear underdogs against France. Meanwhile, if Switzerland loses to France on Friday, the Swiss would still project to finish second in the group, because the meek Honduran squad is their only remaining hurdle. In fact, if the Swiss lose to France, Ecuador beats Honduras, and Switzerland only earns a draw against Honduras (an unlikely outcome), the Swiss would still be expected to advance over Ecuador by a slim margin — unless Ecuador beats France (or draws and posts a better goal differential than Switzerland). In other words, there are a lot of ways the Swiss can get out of Group E that don’t depend on them picking up points against France. The situation playing out in Group D, where Italy will face Costa Rica at noon Friday, is superficially similar. Like France and Switzerland, Costa Rica and Italy won their first matches of the tournament. Neither team’s odds of advancement are quite as high as its counterparts in Group E, though, mainly because there are no weak sides like Honduras to pick up easy points against. Costa Rica is the worst SPI team in the group, and it ranks 25th in the world. Whoever loses will have a fighting chance against Uruguay to qualify for the knockout round in the group’s second position. But that’s nowhere near as favorable a spot as the France-Switzerland loser will be sitting in after the day’s action ends. Luis Suarez and Wayne Rooney prompted many questions before Thursday’s Group D showdown between Uruguay and England. Would Suarez, who missed Uruguay’s loss to Costa Rica in its World Cup opener because of knee surgery, be match-fit for 90 minutes in a must-win game? Could Rooney, whose performance against Italy brought his place in England’s lineup into question, break his career World Cup scoring drought? Those questions were answered in Sao Paulo. Suarez hadn’t played since May 11, but there was no evidence of rust. Of his four shots, two were on target — both goals. The latter goal, breaking a tie in the 85th minute, virtually ensured England’s second-consecutive loss in the tournament’s group stage, something England hadn’t experienced since 1950. Uruguay beat a European team at the World Cup for the first time in 16 matches since 1970, but don’t blame Rooney. He got off four shots, including two on goal and another that hit the post. Rooney found his World Cup breakthrough with a 75th-minute equalizer. The goal took him 10 World Cup matches — 758 minutes of play. England’s 78.1 pass completion percentage ranked in the bottom 35 percent of all teams in this World Cup, but it was easily the best in this game. Uruguay posted the worst completion percentage by a winning team in a World Cup win since at least the 1966 tournament (the start of ESPN Stats & Info’s data set). Uruguay’s 59.2 pass completion percentage against England was the only team performance in a game below 65 percent at this tournament. As neighbors, France and Switzerland have a lot more in common than a World Cup match. Given their proximity, it makes sense that there would be population overlap. Organization for Economic Cooperation and Development data from 2009 shows that Switzerland has provided over twice the amount of nationals living in France than the other way around; there were 90,551 Swiss nationals living in France and 42,862 French nationals living in Switzerland. But given the population of each country, the French living in Switzerland make up five times the share of Swiss who made the opposite trek. CORRECTION (June 20, 10:05 a.m.): A previous version of the chart in this article showed the incorrect proportion of France’s projected 53 percent win.